Rolling it thin, makes a crisper roll kuchen and leaving it a bit thicker makes for a softer roll kuchen. No doubt you'll be making them a few times in summer, so you can experiment on how you prefer them. Because the dough is rich, its very easy to work with. No sticking problems. 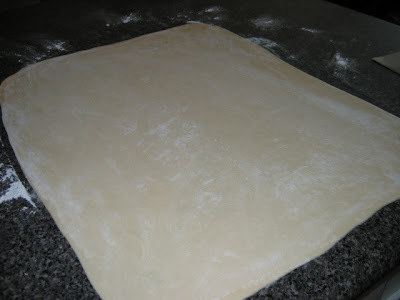 Cut the dough into about 3 -4 long strips and then cut across to make rectangular shapes. Cut 2 slits in the middle of each so that they don't become one big balloon in the hot fat. Heat some fat up in a large pot. I use Canola Oil. 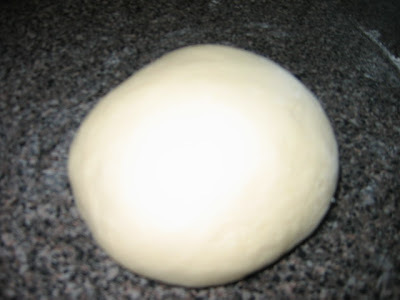 When the fat has little bubbles coming to the surface, it is likely hot enough, but put in a small piece of dough to test it. I know there are tricks for this but for the life of me I can't think of one of them. Ladies, help me out here. Also, there are as many different recipes for this as there are Mennonite women. I'd love to know what your recipe ingredients and amounts are. Please let us know your tricks. I'd love to improve on my attempts. Eat as many as satisfies. I have no idea how many I ate today but somewhere along the line, I got out the Rogers golden syrup and started to dip the roll kuchen in that . .(for dessert). So, tell me, how do you eat your roll kuchen. (rolled cookies) Is that the right translation? Tell me if its not . . .please so that I can correct that sooner rather than later. and strawberry season is just about on us. That looks like pishkee. My mom (russian peasant) made this for a snack for us growing up. Oh yum thanks for sharing your recipe. Perfect with watermelon! I'm putting weight on just looking cuz I know I couldn't stop at just one. I am drooling!!! Nothing like roll kuchen in summer! 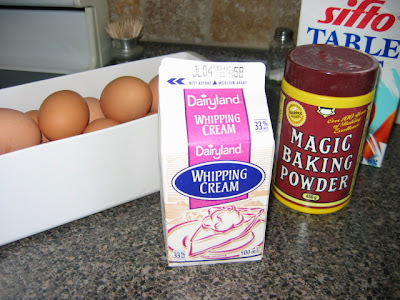 Recipe is the same as mine except for the baking powder, mine calls for 2 tsp. And I don't cut the slits as my family likes the "pillow effect". I don't have a real test when the oil is hot enough and just go by trial and error, seems to work and I've made these for many summers! Oh and Roger's corn syrup is the best for dipping roll kuchen. Your translation to "roll cookies" sounds about right to me. I imagine them with powdered sugar on top...more mess,more fun,more embarrasing pictures! the funny thing is I've always wanted to try making them without the slits, because I like the pillow effect too. Next time I'm going to make them "lighter" and shave a few calories off. woohoo. 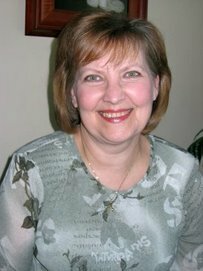 ellen, I was talking to Terry this morning about our similar recipes, you from a russian peasant background and me from a russian mennonite background. I'm sure they must have shared recipes back and forth in the neighborhoods even back then. How interesting. They're also very good with soup!! If you want to enjoy them all year long =). I haven't made them for a long time, but now I will have to ... as soon as we get summer! My Mom's recipe calls for milk with a few TBSP vinegar and a few TBSp oil. I guess the end result in calories is the same, but her take is that vinegar helps not to absorb the oil. (?) She also used more BP and when she cut the slit in the centre she pulled one side through to make the shape of a bow tie. YOur Rollkuchen picture should inspire anyone to try to make them! I think I may just go and get that watermellon today yet. 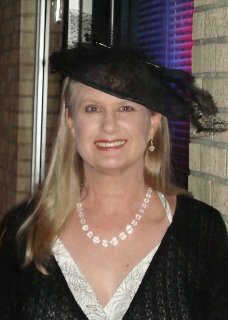 I came across your blog a few months ago and have really enjoyed it. I've even seen people I know in your pictures! Also have made some of your recipes and they're very good. Anyway, when making Rollkuchen this is how you can check if the oil is hot enough - when you put in one of your dough pieces it should be browned in a couple of seconds, turn it over for a couple of seconds and take it out. If it takes longer, your oil is not hot enough. You get the best results if the dough is thin and the frying is really quick. I like the pillow effect too...so I cut my Roll Kuchen in 1" strips and then the puffed result is just right!! And makes a nice pocket when you want to eat them with fresh freezer strawberry jam!! Who needs to eat 'healthy' when tradition tastes soooooo good!! This recipe sounds (and looks) very similar to a wonderful little deep fried pastry that my tiny, but pleasingly plump, German grandma would make. We usually had them with soup, sometimes with jelly or preserves, and sometimes with powdered sugar sprinkled over them. She called them "keuchles" and pronounced them sort of like "kee-kuls." I may have to try her old recipe again...I sure miss her wonderful German cooking/baking! Wow. And here I sit eating my fiber filled cereal topped with bananas, which I thought was tasting rather tasty, but you just brought tasty to a whole nuther playing field! I am envious of you! Enjoy one for me! They look great however you pronounce them! I am now having a serious craving. My mom makes them for me as doing any cooking with hot oil freaks me out :) I think I shall have to let her know it's roll kuchen season! Love them with watermelon...or just plain. YUM! yummy those look good. ellie already mentioned that we ate our rollkuchen with a twisty through the slit. our kids love putting jam in the middle of the little pillows that puff. i usually don't twist all of mine. some people like them thin and crunchy other like them thick and chewy...me i will eat them any old way. these are definately one of the things about summer i look forward to. my moms also serves them with cabbage borscht, but i don't go to all that effort. i only make them in the summer. LASS GUT SCHMECKEN!!!!! !oLOAT GOEAT SCHMAECKE . thanks Lovella-it looks yummy....come over to my place, I just tagged you for a Restaurant Meme. My recipe is pretty similar to yours, but I "twist" mine through the holes to create a bit of a different effect. It's hard to explain, but you've probably seen them this way. And I always use cream. Once I tried making them with milk and they weren't that great. Our family also likes to bring out the Roger's Golden Syrup for an extra boost of badness. I love rollkuchen and it's something I'll never quit making. I still have never tried this treat! I don't get all the hoooplaa about it!?! I think you'll have to make it a summer tradition. You make the roll kuchen and have everyone BYOW! One of these days I'm sure I'll get to savour the flavour. Have a great day! The picture of watermellon and roll Kuchen is the epitome of summer. Thanks for the rejuvenation! Summer is almost here; I can taste it! I am not mennonite, so I must say that this whole roll kuchen thing mystifies me. 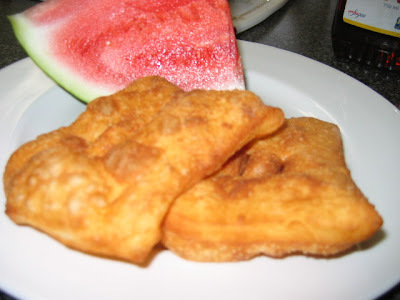 How can deep fried "bread" and watermelon be a meal? I am astounded. But alas, I have never tasted the "meal" that everyone states is the most delicious thing ever. I guess until I try it, I should not judge. But honestly, I just don't get it. this looks soo good! I love the mennonite recipe traditions. hi lovella. well it looks like i'm out numbered here. I don't like watermelon or roll kuchen. I was once forced into making it by my family but only once. I just don't taste what every one else does I guess. I also don't like borscht so I guess I'm just partly mennonite and maybe the other part is mexican since I love their food. your pictures are nice though. Well, I grew up Mennonite, and have several of the cookbooks, but I haven't made Roll Kuchen much at all!! I do make sopapillas, and they seem similar, even lighter than RK, and you don't make a slit in them because you want them to put up in the oil so you can bite a corner off, and fill the inside with honey!! That is a New Mexican recipe. Living in the States, we don't have Roger's syrup here, either, except that I buy some whenever I get up to Abbotsford! I meant "puff up", not put up!! Why didn't I think to ask for Roll Kuchen, too, when I was at my parents place? ha ha I love it dipped in syrup. Mmmm. Mmmm. Mmmm. I came here via Island Sparrow to see your roll kuchen and now that I see what it is and how you make it, it reminds me of what I make. I got the "recipe" from my Grandma Schumacher, German homemaker. She called it keuchle (like Vicki mentioned). I was just ecstatic to read her post because I have never heard anyone else call fried bread that. I think my grandma made her keuchle with regular yeasted bread dough, she took globs of dough, stretched it out flat, poked a hole in the middle and deep fried it. Most of the time she served it with tomato soup. This meal was common for Lent. We have it with honey, peanut butter, dipped in sugar, and I also use it for Indian Tacos (with Mexican toppings, like tacos). I'd love to try it with strawberries and cream too. Thank you so much for sharing this and Vicki..... I feel a kinship knowing that we share the same German heritage. I tried your recipe today! They are AMAZING! The Perfect texture! I borrowed the commercial deep fryer at work and they were golden brown and delicious. Thank you so much for sharing - and specifically for having a recipe that DOESN'T say "and enough flour for a soft dough!" I served them at work - with a choice of corn syrup, liquid honey, icing sugar or strawberry jam - and yes, of course, watermelon! Yes, I have made Roll Kuchen before. And in our community from around Beaver Flat/Main Centre/Turnhill, Sk...you do have the Roll Kuchen with Watermelon AND Roger's Golden Syrup. It's a must. It's a crime not to have all three together. 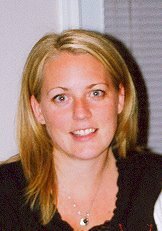 I remember growing up In Winnipeg, Mb, and coming to Saskatchewan to visit the family, and we would have reunions galore with all the Mennonite relations (Klaassens, Klassens, Friesens etc). It was a joy for us children to run around and eat when we were hungry. One of my mother's cousins lived in Southern Manitoba and she would make wonderful Farmer's sausage, and we would save the cracklings and spread it on bread. Or she would make "Pluememeuse" kind of like a borscht with Plums and dates and fruit. It was delicious! I have very fond memories of making roll kuchen with my Oma every summer. It's very, VERY hard to beat with watermelon on a hot summer day. One trick we use to see if the oil is at the right temperature is to dip the end of a wooden spoon into the oil. If bubbles form around the spoon, the oil is hot enough. Haven't read all the comments, so someone might've suggested this already. Mix 2 cups sugar and 1 heaping tbsp flour together. After rolling out dough, put a pile of strawberries in the middle, add a heaping tsp of the sugar/flour mixture, fold dough in half and pinch together before frying.